Plumbing renovation or remodel work can be expensive. After all, plumbers are professionals who, like electricians, attend a trade school, become apprentices for years, and submit to state and other local licensing requirements. A good plumber is highly valuable, often accomplishing feats of plumbing magic in no time at all. But that does not mean that remodel plumbing has to be a fixed-price project with astronomical costs. Smart homeowners employ methods that help them pare down their plumbing contractor bill. Scheduling work with a plumbing contractor will usually be less expensive than calling in an emergency plumber for remodel work. Calling an emergency plumber for an upcoming, planned remodel project that is not time-sensitive is like going to the emergency room for an upcoming elective surgery. You accomplish the same thing but at a vastly higher cost because you are relying on emergency personnel and services. Emergency plumbers like Roto-Rooter who can arrive within an hour for clogged shower drains, backed-up toilets, and leaking pipes are worth their weight in gold. But plumbing contractors are best for scheduled projects like installing new supply pipes in a bathroom remodel. Out of necessity, many plumbers do both emergency plumbing and plumbing renovation or remodel work. So if you are plumber-shopping, see if they list plumbing contracting or plumbing renovation and remodeling along with the list of emergency repairs they do. When calling the plumber, specify that this is not a rush job. 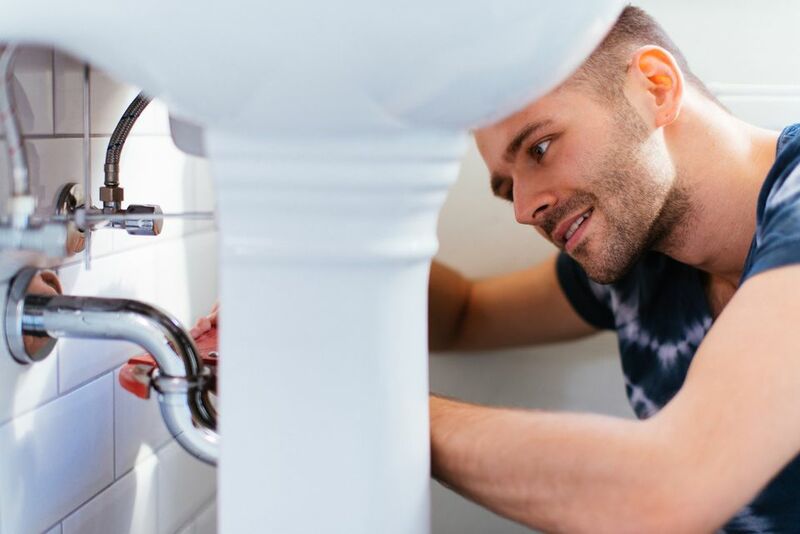 The more non-plumbing activities the plumber performs, the higher your final costs will be. Imagine visiting a lawyer and asking her to fill out simple non-legal paperwork that you could easily do on your own. She may agree to help, but why pay high lawyer or even paralegal fees for basic clerical work? Plumbers exist to do plumbing; this is what they do best. But peripheral projects often get in the way. Plumbers may need to pull out drywall to get to the pipes. They might find the area inaccessible and need to move stuff out of the way. Lighting might be inadequate. It is guaranteed that the more non-plumbing tasks you can accomplish before the plumber arrives, the less you will pay for your plumbing project. Carefully pare down the plumber's activities so they only relate to plumbing. Changing the plumbing footprint, or layout, increases costs. Moving around supply and drain pipes, and especially large items like sewer pipe and vent stacks, will always cost more money. Try to keep your shower, sink, and toilet in place for bathrooms. Do your best to keep the dishwasher and sink in place for kitchen remodels. Naturally, the ultimate way to save money on a plumber is to eliminate the plumber. When you do your own plumbing work instead of hiring a plumber, you pay only for materials, not materials and labor. If you have the curiosity and inclination, you can save thousands of dollars by running your own pipes. Yet some projects are so involved that doing it all by yourself is not possible. In this case, consider having the plumber do some work, such as establishing stub-out supply points, while you supplement by bringing the stub-outs the rest of the way to the sink. One thing that makes do-it-yourself plumbing feasible is the combination of PEX and push-fit couplings. Red plastic PEX pipes are hot and blue are cold. Easy to cut with a snipper, PEX pipes can make 8-inch bends and they easily snap together with push-fit couplings. One downside to supplementing with your own plumbing work is the sizable initial cost of purchasing plumbing tools. PEX pipe is cheaper than copper. Similar to the auto mechanic, with contract plumbers you pay for labor and materials. So, while you cannot bring down the plumber's labor charges, you can ask about the choice of materials, chiefly copper pipe over PEX pipe. Rigid plastic PEX pipe tends to be about two-thirds less expensive than copper pipe. Copper is an expensive commodity, making it subject to price fluctuations, usually upward. While PEX is petroleum-based and oil prices do rise and fall, its cost remains stable and low. If the plumber plans to use copper for your remodel project, ask if the plumber will consider the lower cost alternative: PEX. Crimp-fit couplings are cheaper than push-fit couplings. There are two ways to join PEX pipe: push-fit couplings (SharkBite is one major brand) and crimp-ring style. Push-fit couplings allow you to push the two sections of pipe together with no tools. The pipes stay in place until you decide to remove them with a special tool. Crimp fittings require you to squeeze a copper ring over the PEX pipe and a different type of copper fitting. A crimping tool is used to squeeze the ring in place. Push-fit couplings can be as much as 10 times more expensive than crimp couplings. Clarify with the plumber whether or not they will not be using push-fit couplings in great quantities. Push-fit couplings are fine for a small project, but they drive materials costs sky-high when used in great numbers. Most skilled plumbers can crimp rings nearly as fast as they can join the push-fit couplings. No plumber should directly charge more money to a customer if the working conditions are less than perfect. But you should do everything, within reason, to help the plumber help you. If possible, make sure that the temperature provides for comfortable working conditions. Remove annoyances such as roaming pets and curious children that might distract them from doing their best job. If you have a second bathroom that will be operable during your project, let the plumber use it. Many homeowners will not allow workers to use their bathrooms. Workers who leave the work site to hunt down a public bathroom only slow down your project and drive up costs. Being nervous about workers using your bathroom is understandable from the standpoint of cleanliness. It helps to remove your bath mats and your nice towels and to replace them with a roll of paper towels. Also, since this is your house, it is within your rights to ask the plumber to keep everything as clean as possible. What Are the Best Brands for Plumbing Tools and Fixtures? What Should You Expect During a Sewer Video Inspection?